Since it looks that you are preparing to move to another platform I'd like to brought up a few small problems concerning flash version. Perhaps you could solve some of them in unity, so that we get even better game experience with this new build. 1)Finding territories on large maps. After I receive a ctrl-link inside message and click it,the territory gets highlited with this glowing, pink-colored, halo ring. Problem is that it is scalling with map zoom so when you look at big map it is sometimes very hard to see which one of houndreds of tiny territories is actually higlighted. Could make this halo ring to scalle differently (similar to what you have done with army numbers)? That way it would be easily seen even on zoomed out view. Right now we can change the coulor of our opponents. We can for instance make red-color player being displayed as blue-color. This option could be a good solution for previous problem (3rd) because one could change colors of opponents so that in particular teams colors of players would match visually (like making all players from team C being green-cououred (drak green, green, light green etc)). Problem is that this option is not memorized. After you change the color of particular player, the next time you open the game everythig is being reset to defalut.... Could you then make this "change color" option to persist longer? I have just created a game in which every bonus has one wasteland territory. Problem is that I also implemented heavy fog. With this setting one cant see the value of neutrlas. Whch means that players must check game history anytime they plan to attack neutral territory, only to make sure whether it is wasteland or not. Also in normal-fog games I am sometimes forced to get back to game history only to check whether there is any wasteland inside the bonus which I am planning to attack. It is very annoying, especially for those using mobile version. Would it be possible to make wastelands graphically distinct? Or to implement a button which would temporally highlight all wastelands? 6)Finding commands on commands list. Some times players decide to change their orders. They can easily adjust the number of armies being sent by clicking on particular command on game-map. But to change the order of moves player have to manually find such action on the list of commands. In lage games, where thare are dozens of commands each turn, it is very, very annoying, especially on mobile version. It could be helpfull if orders which are actually being modified (on map screen) are also automatically highlighted on command list. Once you "open" any command (which means you have this small windowopened, in whichyou can adjust numbers of armies being sent etc) command list could be automatically scrolled so that such command is positioned in the middle of it. That way you can easily find it on such list. To check the detail commnads of ally, one have to use the option to check his moves. Nonetheless, it would be much easier if players could also check commands of their allies by simply clicking on thier territories. That way if player clicked on the territory of his teammate, game would display all actions (attacks/transfers/airlifts/blockades etc)taking place in this particular territory. Of course this would not give all information (sice to check move order one would still need to use option to see whole list of ally's commands) but this could be a very helpfull way to swiflty check on what our teammates are doing... This could be especially helpfull for mobile app users. 8) Inviting friends to open games. Could you consider allowing for "reservations" of open slots in team games? That way if players takes first open-seat in empty -team, rest of empty seats in this particular team would be "locked" for some time (like 24h - this could be customizable by game creator). Player would be allowed to send invitations for such "locked" spaces to his teammates, and during this time period noone could be allowed to use such reserved seats without invitation. This option could be "optional" but I am sure manz more players would join custom games if it was allowed. 5: That is the reason why I don't use the wasteland options for dense, heavy or complete fog. Is it possible to make fast orders for multi-attack? because on large maps it takes hours to make multi-attack orders, moreover it is impossible to make those orders on your smartphone. 8) I feel like WarLight has been needing this for a long time. No doubt it would be hard to implement because of these questions, but possibly they should be found in create-game settings. Who is allowed to invite? How many people can they invite? 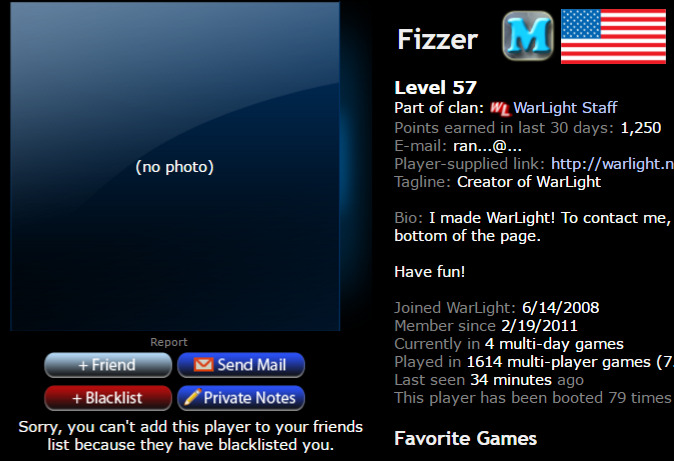 Can they invite players on [the game creator]'s blacklist? What happens when a player stalls a game by inviting an inactive player? (One that never joins.) There are more questions, but I'll leave it there. 8) I see it that way. -players should be allowed to send this invitations to whoever they want and to as many players as they desire. For instance if player have 3 empty seats reserved for 24h, he should be able to send invites to many of his friends. Of course only 3 of them (probably the ones who responded first) would be able to join. I definitely agree with the concept in clause three. I think it would be better if there were more colors. You could label a whole team different forms of one color (i.e, green, pine, hunter green...etc) that way, you won't be confused when looking at an opposing team's individual members. This is the best list of possible game improvements i've ever seen here. Kudos! I agree with all mentioned. You should become a consultant for Fizzer. Hmmm, but how to sent this list directly to Fizzer? By sending him a link to this thread via mail system? send him a mail. its not that hard. and hes not that scary to talk to. BTW - any other ideas?